By way of its nature and its historical background, The Knights Templar is a Christian Masonic Order. Both the Temple Degree and the Malta Degree have their roots in the Holy Land during the Crusade era, but on this question it must be remembered that there is no direct link of descent from the Operative Templars or Hospitallers to the Degrees worked in our modern Preceptories today. In the mid 1700’s the Freemasons began to incorporate symbols and traditions of the medieval Knights Templar and the modern order has evolved from that association. 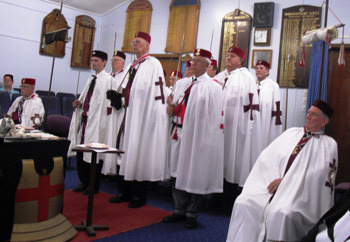 The Knight Templar Degree places the candidate in the position of a Pilgrim travelling symbolically through hardship and dangers until he is received as a Christian Knight. The Knight of Malta Degree relates the story of St. Paul’s arrival on the Island of Melita which is known today as Malta. Cooroora Preceptory comes under the jurisdiction of The Great Priory of Queensland. It’s history and creation is a story in perseverance which started in 1959 and fought its way to it consecration on the 30th of Sept 1961 at the Yandina Masonic centre. Since 1961 the preceptory has had several homes before moving to it’s current location in Maroochydore Masonic Centre. The Order of Knights Templar is open to all Master Masons of the Christian faith who believe in the Holy Trinity and of good standing in their Craft Lodge. The Preceptory meets of the 5th Saturday of the month which generally happens only 4 times a year. Dues are $50.oo per year. The greatest expense is the regalia which can be arranged through the preceptory. Read More on the History of Cooroora Preceptory.